Decode the 1951 Buick Body Tag to see how your 1951 Buick came originally from the factory. It is a plate located under the hood attached to the outer dash (passenger side). Use this guide to start your 1951 Buick Body Tag decode now! STYLE NO. Specifies the Fisher Body Style. 50 means 1951 model year. 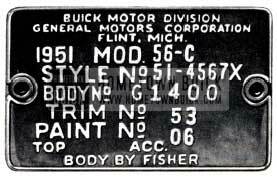 The next digit “4” stands for Buick (Fisher Body produced bodies for Cadillac, Oldsmobile and others, too). Next one is for the series: 3 (Special), 5 (Super) or 7 (Roadmaster). 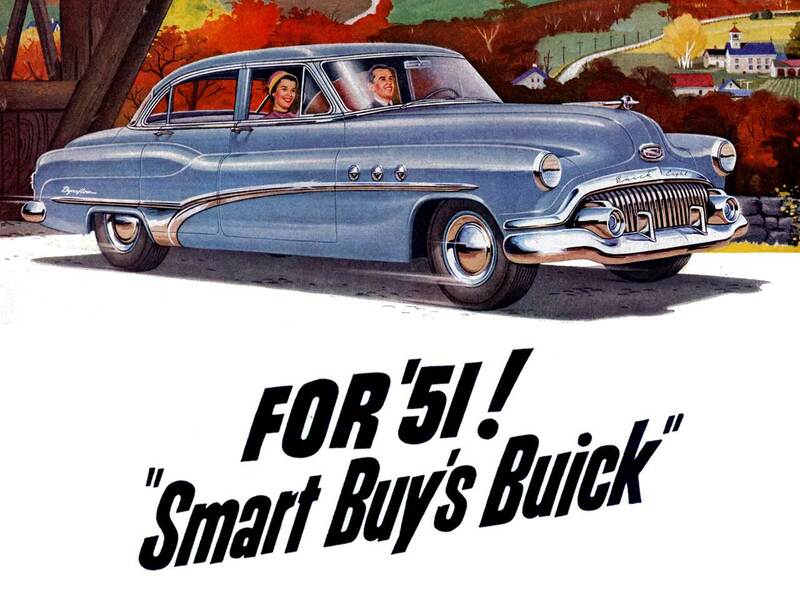 The rest tells us the exact model (see 1951 Buick Production Overview)! TRIM NO. This info shows which interior was chosen. Please see our 1951 Buick Interior Trim section. PAINT NO. The original exterior paint is given here. Look it up on this 1951 Buick Colors page. TOP & ACC Some of the factory installed options were marked here. Compare the letters with this list of 1951 Buick Optional Equipment. Each 1951 Buick has an individual vehicle identification number stamped on the VIN tag. The plate is affixed to left front windshield pillar post and is visible by opening the left front door. First digit This indicates the assembly plant. Seven additional digits This is the production sequence number.